d Ischemic colitis in the ascending colon of a 79-year-old patient. There is some patchy submucosal bleeding, while the surrounding mucosa appears pale and livid. There are also small erosions with fibrinous exudates in the mucosa. Ischemia in the neoterminal ileum after prior right hemicolectomy for carcinoma. The mucosa is pale and has multiple bleeding foci. Circumscribed ischemic colitis affecting the sigmoid and descending colon in a 72-year-old woman. The mucosa is reddened, has signs of submucosal bleeding, and is slightly polypoid (endoscopic equivalent of thumbprint-ing seen on radiographs). f e d Ischemic colitis in the ascending colon of a 79-year-old patient. There is some patchy submucosal bleeding, while the surrounding mucosa appears pale and livid. There are also small erosions with fibrinous exudates in the mucosa. g Low-grade pronounced ischemic colitis. Adjacent to this lesion the patient had pronounced ischemic colitis. This is presumably nonocclusive ischemic colitis. h Flat ulcers on a reddened mucosa. Non-transmural ischemia in the descending colon. i Ischemic proctitis with mucosal membranes presenting as pseudomembranous. Clostridium difficile was not detected. f e g Low-grade pronounced ischemic colitis. Adjacent to this lesion the patient had pronounced ischemic colitis. This is presumably nonocclusive ischemic colitis. Ulcerative colitis and Crohn disease. Heavy bleeding is responsible for 6-10% of emergency surgical procedures in patients with ulcerative colitis; ulcerative colitis is the cause of lower gastrointestinal bleeding in 2-8 % of patients (overview in 64). Nevertheless, massive lower gastrointestinal bleeding is not a frequent occurrence in chronic inflammatory bowel diseases. Massive hemorrhaging leads to hospitalization in 0.1% of patients with ulcerative colitis and 1.2% of patients with Crohn disease (37) (Figs. 13.22,13.23). Among Crohn patients, bleeding localization has been said to be evenly distributed among the small bowel, ileocolonic junction, and colon (37). Two studies have contradicted this, however. One cited the colon (6) and the other the ileocolonic junction (17) (Figs. 13.22,13.23) as the sites of predilection for gastrointestinal bleeding in Crohn disease. ► In half of all patients with bleeding related to chronic inflammatory bowel diseases, cessation of bleeding is spontaneous. However, the rate of rebleeding is 35% (44). In about half of patients in whom bleeding does not cease spontaneously, operative intervention is required (37) and is associated with an elevated risk. ► In the majority of cases of hemorrhaging induced by chronic inflammatory bowel diseases, bleeding is diffuse; there are, however, circumscribed bleeding sources which are endoscopically treatable. Pardi et al. (37) used epinephrine injection as well as bipolar coagulation. ► Hirana et al. (26) treated bleeding in a patient with ulcerative colitis endoscopically, using injection of a mixture of absolute alcohol and 1 % polidocanol. Hemoclips have also has been shown to successfully achieve he-mostasis (60) (Fig. 13.22). Infectious colitis. Though infectious colitis can present with bloody diarrhea, life-threatening hemorrhage is rare. Hemorrhaging has been observed in colitis caused by Salmonella typhi, Salmonella typhimurium, Escherichia coli 0157:H7 (EHEC), and cytomegalovirus. 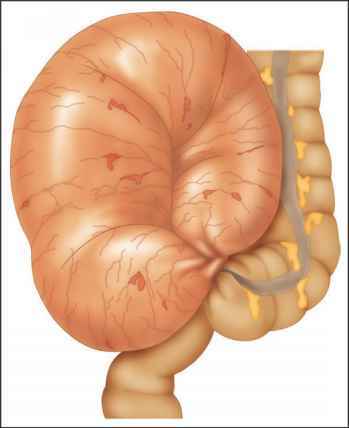 Pseudomembranous colitis can also manifest as acute lower gastrointestinal bleeding. ^jk ® 13.4 shows varying degrees of infectious colitis attack due to various causes. Endoscopic intervention is generally not necessary. Fig. 13.22 a Bleeding in Crohn disease. Bleeding from the mucosa on the Bauhin valve in Crohn disease. b Cessation of bleeding after clip application. Fig. 13.23 Low-grade bleeding from the mucosa on the Bauhin valve in Crohn disease. The lumen of the Bauhin valve is distorted by scarring. Bleeding in infectious (self-limiting) colitis in the descending colon. No pathogen detected. c Campylobacter jejuni infection of the colon. Ulceration (b) and bloody diarrhea led to hospitalization. Patchy ulceration on the Bauhin valve with small visible vessel on the ulcer periphery (c). What is sigmoid pale mucosa?